The new Trans for Carriers (TfC) is an all-in-one tool – no e-mails or text messages. Easy, quick and convenient, with the Trans.eu exchange. Easy confirmation of the acceptance of freight offer; for regular contracts - simple offering of price in answer to auction. TfC uses the SmartMatch algorithm, suggesting specific loads to carriers. The algorithm takes into account many variables, e.g. the carrier's fleet, the routes they usually choose, previous cooperation with the shipper, opinions and the TCC certificate. TfC enables integration of carrier's telematics and easy communication and order status determination – without additional e-mails and Excel. TfC includes options of automatic invoices based on previously completed orders, with the possibility to settle additional fees and contractual penalties. Profitability depends on whether the vehicles operate continuously and for good rates. The vehicle usage planner allows to plan continuous vehicle work even for 2-3 weeks ahead, with automatic freight proposals for periods without any fixed orders. In order to determine the freight’s price, besides of many factors related to the load (season, number of unloading locations, etc. ), it is crucial to properly plan the truck’s actual route. It is good to know the rates valid for a given part of the season, a given route and a given body type. Without this information, the price set by the carrier may either turn out to be too high, in which case they would not get the order, or to low, which would decrease their profit. TfC uses an algorithm which proposes carriers to specific shippers. Certification such as TCC Elite (Trans.eu Certified Carrier) increases the chances for new transactions. New transport exchange Access to one of the largest transport communities in Europe. It is a new tool integrated with the logistics platform. 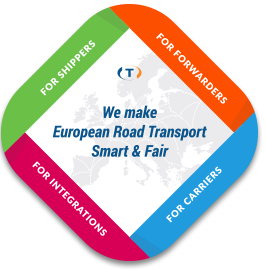 Automation of cooperation Easy confirmation of accepting regular and occasional freights from your shipper. Freight auctions Participation in order auctions with a fixed price or with a possibility to suggest prices. Management of orders from a shipper Accepting and giving statuses to electronic orders from the shipper. Quick order confirmation Electronic confirmation of order completion for quicker invoicing. Fleet integration with telematics Ability to share the position of a vehicle with a load. Access to a convenient messenger One tool for conversations with customers: segregates conversations according to context and archives findings.